Eight Small Natural Gold Nuggets from Alaska. These are the type of nuggets that Jewelers love for inlaying onto rings, watchbands, cabochons, etc… . The weight of the 8 gold nuggets is 15.4 Grains (1.0 Gram) and the nuggets range in size from approximately 1/8" (3 mm) to 3/16" (5 mm) long. These gold nuggets are jewelry grade nuggets, the highest grade of natural gold nuggets that you can buy. 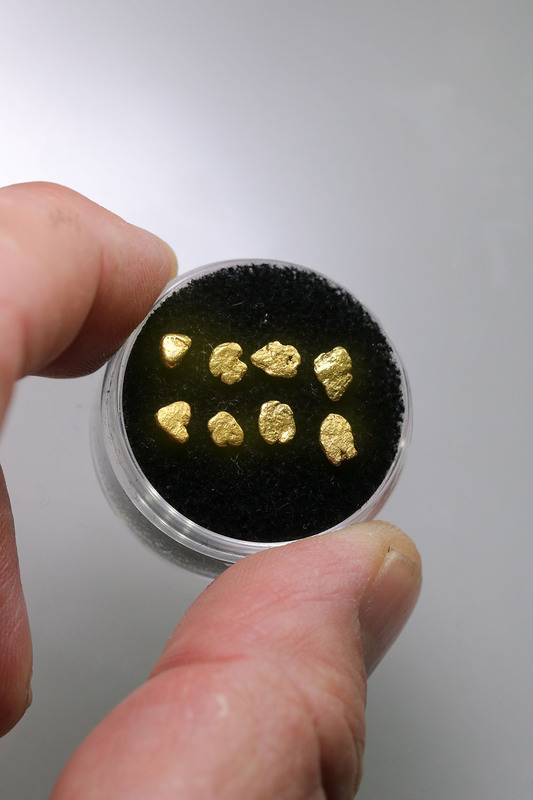 These nuggets have a beautiful color and are superb and shiny clean gold nuggets. They are wonderful for jewelry making or would make a nice gift. This lot is from a large batch of gold nuggets from Alaska, which are all similar in size, so I reuse the photo from this batch. The Gold Nuggets you receive will be very similar to the ones in the photo but will not be the exact gold nuggets pictures.